In the Fall 2010 semester the Lab will explore the essential functions of the museum with the aim of inverting the traditional museum program and identifying new ways of making its internal processes of collection, conservation and interpretation more accessible and socially engaging. As evident in a range of recent projects, museums are increasingly interested in making their internal processes transparent –even participatory– for their visitors through on-the-floor staff interactions, visible study collections, interfaces to digital resources and the use of social media. These techniques and technologies allow museums to explore and even to blur the boundaries between ‘front of house’ and ‘back of house’ functions and afford new ways for the museum to connect with its audience. The American Association of Museums (AAM) defines the museum as being comprised as a set of specific activities that are conducted under a guiding mission. These include: collection, conservation, interpretation, education, and exhibition. Unless we are museum professionals working within an active museum, most of our attention as members of the public is traditionally focused on exhibitions, and perhaps occasionally on an educational event or program. The first three activities listed represent for most of us that mysterious hidden world behind the gallery walls and are often misunderstood, or at the very least under-appreciated while the activities of collection, conservation and scholarship are essential to any museum. Some might even suggest that there is a subtle institutional progression implied in this list of activities that places them in a linear hierarchy with the first – collection – being somehow the most essential and the last – exhibition – being almost an operational burden. It goes something like this: if you do not collect there is nothing to conserve. Scholarship and interpretation requires an object of study. If you do not have scholarship then you cannot teach and if finally you do not have anything unique to say then what will your exhibition hope to communicate to its visitors? That may be a bit rash but you get the point. Historically the systems of collecting and interpreting natural, cultural and artistic heritage have indeed informed the development of a museum’s architecture, its exhibitions and public programs. As systems of collecting and the construction of knowledge have changed over the last two centuries, we have seen corresponding changes in museum architecture, exhibition and programming. We will explore how these changes played out in the museum, what societal forces drove the changes, and how design and museum practices have responded. We will identify emergent approaches in a range of new and existing museums. We will look at architecture, exhibition, technology, media, and the role of the curator and designer in shaping museum experience. I am in interested in weaving together a number of disparate threads that I believe are catalyzing in this shift toward making the museum’s ‘back of house’ increasingly visible and essential to connecting with their visitors. After a decade characterized by iconic museum buildings and expensive permanent exhibitions and the subsequent decline of philanthropic support due to the downturn in the economy, museums are now looking hard at ways of making more value out of their existing assets. Back of House aims to explore this trend across at least three modes of implementation: the physical, the personal and the digital. Over the last 50 years there has been a dramatic change in museum architecture. Long gone are the vaulted, naturally lit galleries of the early 20th Century and the ideals of symmetry, solid masonry walls, steep stairs and pillared portico entries. Modernism brought a disciplined rationality to buildings that were optimized for flexibility, flow and operational performance. Postmodernism was marked by what we might be called narrative architecture. These are buildings that are purpose-designed to a specific text and meant to convey a specific story. Now, at the culmination of a museum building boom that lasted almost 20 years, there is a new trend emerging. In museums both recent and currently underway we are seeing an opening up of buildings, deconstructing the formality of the gallery, extensive use of glass and day-lighting, dramatic views both inside and beyond the walls of the museum, views into research areas, visible storage, study centers and high density collections displays, and a hybridization of traditional museum program or ‘nested’ programs where learning laboratories and other facilities are literally embedded within the gallery. The Luce Foundation sponsored study centers at the Smithsonian, Metropolitan Museum or the Brooklyn Museum are examples of this approach. Another example might be the London Museum of Natural History’s new Darwin Centre­—a multistory, light-filled building attached to the original neo-gothic structure of this venerable museum, like a cocoon that opens to reveal the scientific research and collections functions of the museum to the visiting public. The second theme we will explore is the status of the physical object in museums. While this will not be a class on materiality or material culture, we will explore the role of the museum collection as it relates to the function of the museum, conservation, interpretation, and exhibition. Recent publications such as Sherry Turkle’s Evocative Objects or historian Stephen Conn’s Do Museums Still Need Objects? explore the status of the analog object in the age that appears to favor the digital medium. The title of Conn’s book is striking. In fact it is almost alarming. Conn is a scholar and has spent a career rigorously mapping the changing topography of the museum as it responds to nuanced changes in society. The title is very direct and implies that an urgently needed, practical discussion will follow. The fact is that there are many, and perhaps even an increasing number of museums without objects. What is at stake in this trend? The third theme concerns the advent of social networking applications and the integration of technology into the museum experience and the consequent “decline of the expert.” The ubiquity of social networking applications may be a symptom of society’s constant search for order and empathy that has been enabled and made visible by new technologies. At the very least, it reinforces the increasing importance we place in the definition of the Self as we seek to clarify and document our unique worldview, while at the same time atomizing into online micro-communities of like-minded individuals. We define ourselves by the connections we make in social space and the things we collect and give preference to. Museums have also traditionally facilitated this. The boundaries between traditional roles, responsibilities and authorities have shifted. We are now simultaneously content producers, curators and consumers. Museums are exploring ways to incorporate user-generated content and participatory experiences where the visitor becomes integral to the production of the experience. The scholar’s voice is just a starting point. In some cases it does not exist at all. The visitor’s voice joins a cacophony of others to form an infinite number of meanings where the project of interpretation is never finished. Nina Simon’s new book The Participatory Museum explores these ideas in depth and is sure to become a staple for museum professionals for the years to come. Other projects like steve.museum explores ways that social tagging can enhance the public assess and use of museum resources. What do these new social networking tools and digital assets provide to museums as they seek to communicate with our public? What does this mean for the role of the curator, scholarship and education in the museum? Lastly, and more so than any architect or museum design professional, I am deeply motivated by a number of artists who actively use museum architecture, collections and processes as a site for their art. David Wilson’s LA-based Museum of Jurassic Technology; Ilya Kabakov’s immersive, and sometimes intentionally unfinished art gallery installations; Sophie Calle’s documentary approach utilizing photography and objects as evidence of a grand narrative; Andrea Fraser’s unauthorized, although seemingly ‘official’ museum tours; Mark Dion’s use of traditional archeological and forensic sciences and mock expeditions in unexpected places; filmmaker Peter Greenaway’s “100 Objects to Represent the World” and interactive room-sized talking painting “Wedding at Cana” at the last Venice Biennale; are just a few that come to mind. We will explore these works of art and see what they might teach us and ways of visually expressing the essential activities of the museum. Throughout human history museums have had to adjust in form, structure and technique relative to a changes in societal structures and needs. The next series of posts will explore three stages of transformation of the museum (and perhaps an emergent stage). I will admit it is a bit bold to try write a historiography of the museum on a weblog post. So I will choose to diagram it instead. Of course these are gross simplifications of very complex issues that deserve a historians’ proper attention but the words contained in these diagrams do in fact owe a debt to the writings of social historians Elean-Hooper Greenhill and Tony Bennet, who’s influential works have shaped my sense of how contemporary museums came to be. These proto-museums were centers of power, focused expressions of the sovereign’s dominion over the world and his subjects. Cabinets of Curiosity, Wunderkammern, the Studiolo were owned and made by noble European families living in the early Renaissance and lasting through the Baroque. The Cabinet was characterized by its symbolic and representational power, an effective theatrical demonstration of the soveriegn’s knowledge and control of his empire, and a symbolic dominion over the earthly world. A good picture here. Combining artifacts and specimens chosen for their rarity and uniqueness. Their script was coded and known only to their owner. They were certainly not accessible to the public and were viewed only by a privileged audience in the service of the sovereign. Many of these private collections formed the basis of early public and university museums. After reading the article “The Museum of the Future” by Walt Lippmann, I was curious and interested in his concept of reproducing artwork. He considered museums as a sanctuary for artwork and stressed that in today’s museum setting, most of these pieces will never leave their “home”. Because museum collections are leaning towards the permanent, viewers have little chance to see certain items if they don’t travel. Traveling to view art, in some eyes, is not always a priority and therefore, certain masterpieces will never be experienced by this audience. “Yet the supply of masterpieces of art and unique objects of great value is limited, whereas all over the world, in every nation and in every city there is a rising demand by greater and greater masses of people for access to these masterpieces and unique objects.”This begs a serious question: should art be reproduced? In the future, museums must discover ways to reach both local and national visitors, and reproducing art, I think is one way to help fix the problem. I am not saying however, that the reproduction artwork should be viewed as the original, nor should it be referenced as a primary source. Reproduction artwork should used similar to a library as Lippmann suggests, to implement its original self- it should be inspiration to view the source, in this case, the masterpiece. Suggesting that famous paintings be copied does seem to take away from it’s splendor and glory, and this notion of copying should be approached with caution. If though the copies provide a way for others, unable to see the original, to connect with the artwork, would it not be considered a success? I want to open this post to everyone’s opinions, I am really curious to see how the group feels about the importance of the “one of a kind” verses the readily available. Would the notion of reproduction lead to the downfall of the museum? Would it take away certain museums’ appeals, or, could it provide a means of further research and study? When recently pressed for their vision of the future of the museum, two totally unrelated people (albeit museum people) began talking in excitedly about libraries they had recently visited. One person noted that if you shuttered a local museum, people might hardly notice. And if you shuttered the local library there would be clamor and outrage. It is true that if given a choice both governments and foundations tend to favor the library. Perhaps there is something far more essential about a library than a museum. The library is at least as old as the museum and likely precedes it by some degree. In fact many of our greatest museums began as new wings of college libraries that had expanded to include objects. These were the great ‘teaching museums’. Libraries are fundamentally akin to museums in that their missions include collecting and preserving knowledge and making that knowledge accessible to a defined end-user. Both provide access to knowledge through collections and use the exhibition as a means to make their holdings more visible. Similar to museums, the earliest libraries were created by and for privileged classes of society. But nowadays libraries are assumed to be integral to any society’s public educational infrastructure, freely accessible spaces of learning and study for everyone. In the developed world access to a good library is considered as fundamental a right as an education, a fair justice system or access to basic utilities such as water and electricity. In the last decade we have seen great innovations in libraries around the world. The old form of the library as a vast repository of books is currently undergoing a renaissance with the rapid development of customizable digital catalogs, new media storage capabilities, the scanner, the web and other interfaces that supplement the physical book. While many prophesied that the Internet would kill the book (fatality still pending), the Net has with some irony made the library more essential as a socializing space where communities share the experience of accessing knowledge content across new mediums. No longer called Libraries, these spaces are now called Media Centers and Information Literacy Centers. The former emphasis on the book is replaced with a more all-encompassing media representing a spectrum of technologies that includes the books and other objects. These are multilingual, multi-modal, inclusive spaces of community engagement, storytelling, and even story-gathering as libraries add recording, broadcasting and distance learning capabilities that enable them not only to preserve content but also to produce and distribute it. Toyo Ito’s Sendai Mediatheque (opened 2001) was an inspiring model for what was to come in the next decade. Not a vision of a library based on the book, Ito’s library placed more emphasis on infrastructure, access and transparency. Also notable is that he decided to essentially build an open structural shell that could be transformed over time by generations of new media, new uses and forms of occupation. He even relinquished control of the interiors assigning each level to a different architect. Snøhetta’s Bibliotheca Alexandrina in Egypt (opened 2002) is a resurrection of Alexander the Great’s iconic library of the same name and perhaps at least mythically, is the most famous library in the world. Salt Lake City Library (opened 2004) designed by architect Moshe Safdie has become a major downtown destination with is coffee and sandwich shops, open fire pits to warm your feet at while you browse half a million titles in their catalog. Soon to follow was Rem Koolhaas’ Seattle Central Library (opened 2004) which has drawn record attendance and use by citizens of Seattle and design tourists. In the true spirit of a library as free source of information, Rem was kind enough to post his concept design brief online for us to review now ten years after he presented it to his visionary client. The Aarhus Library in Jutland, Denmark by SHL Architects (to open 2009) definitely promises to break the out of the moldy, old, quiet, box full of books. “[This library] features an ‘info column,’ where people share digital news stories; an ‘info galleria’ where patrons explore digital maps layered with factoids; a digital floor that lets people immerse themselves in information; and RFID-tagged book phones that kids point at specific books to hear a story.” Sulter The Aarhus Library even created a design lab to research new approaches to library use and design. They made a video to explain their process. Perhaps these library projects can shed some light on where museums need to go to be more effective in the future. 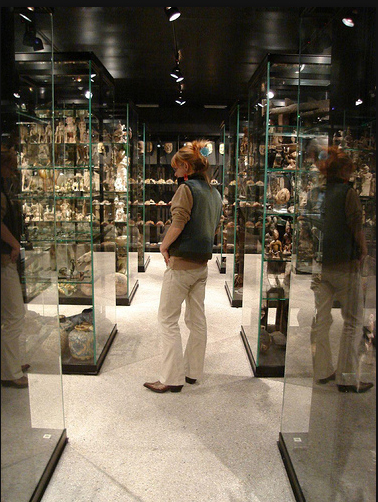 Most museums are burdened with the preservation of vast collections of unique and rare items. Their charters often stipulate that if they cannot preserve their collections, then they have no business doing anything else. This includes engaging with the public with exhibitions, educational programs and new media experiences. It is likely that libraries – whose collections typically only contain a small portion of un-reproducible, rare objects, books and documents – have had an easier time transforming themselves from the inside out.